Spicy BBQ Ranch Burgers - seriously delicious! SO easy and they taste AMAZING!!! We grilled these for a party and everyone RAVED about them!! Ground Beef, Ranch mix, cheddar cheese, lettuce, tomato, bacon and Kingsford® Honey Jalapeño Mesquite BBQ Sauce. Sweet and a little spicy! A new favorite! Anyone else excited about the upcoming Memorial Day holiday? I can not wait for the holiday! It signals the unofficial start of Summer and the Summer grilling season. We grill all year, but we grill at least 4 or 5 times a week during the summer. It is our favorite time of year!!! What is the Best BBQ Sauce for These Spicy BBQ Ranch Burgers? We use a charcoal grill. Our charcoal of choice is Kingsford. Kingsford has been bringing Americans real barbecue flavors since 1920 with its charcoal and wood chips. 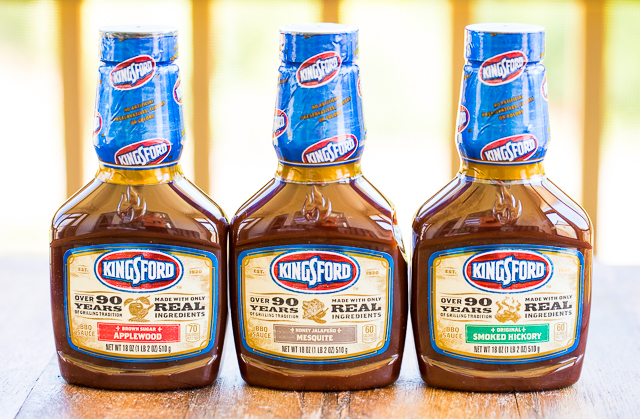 I was excited to see that Kingsford now has a line of BBQ sauces available! I bought three of the new sauces - Original Smoked Hickory BBQ Sauce, Honey Jalapeño Mesquite BBQ Sauce, and Brown Sugar Applewood BBQ Sauce. 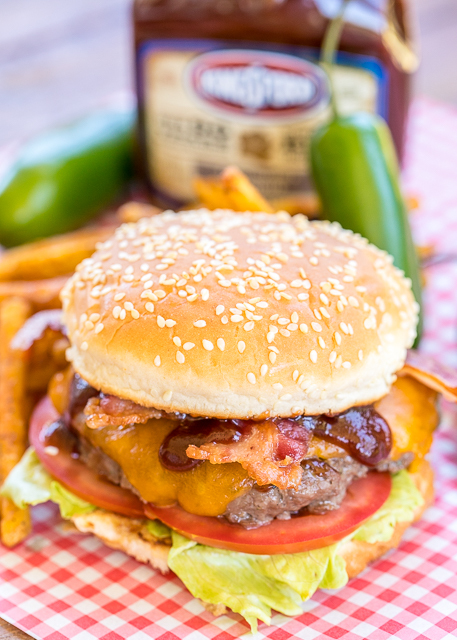 We love burgers, so we whipped up a batch of our favorite Spicy BBQ Ranch Burgers with the Kingsford® Honey Jalapeño Mesquite BBQ Sauce. OMG! Y'all. The burgers were out of this world delicious! Juicy and packed full of great flavor. The burgers are loaded with our favorite flavor combination - cheddar, bacon and ranch. 😍 They are super simple to make and the Kingsford® Honey Jalapeño Mesquite BBQ Sauce really put them over the top. The sauce is sweet and a little spicy. 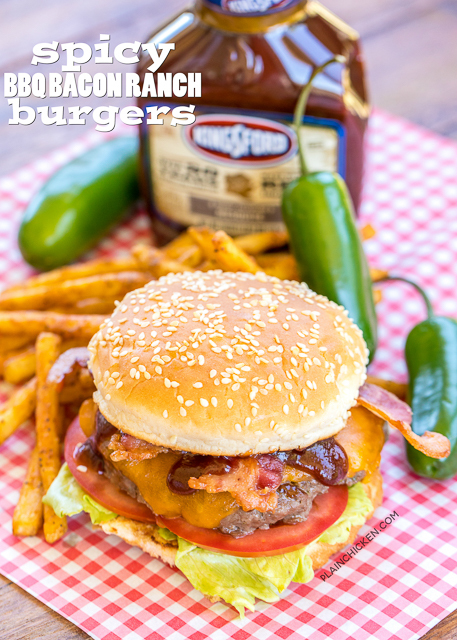 The BBQ sauce gave the burgers that extra kick that made them totally irresistible! These Spicy BBQ Ranch Burgers are super simple to make. Mix together the ground beef and ranch dressing mix. Put the burgers on the grill. Grill the burgers for a few minutes on each side then top with the Kingsford® Honey Jalapeño Mesquite BBQ Sauce and cheese. Can I Freeze Grilled Hamburgers? OMG! Heaven!!! These Spicy BBQ Ranch Burgers are definitely going on our Memorial Day menu. You can make the hamburger patties today and freeze them for the holiday. I actually have a batch in the freezer right now. Just thaw the burger patties completely before grilling. I usually let them sit in the refrigerator overnight. While the grill heats, gently mix ground beef and spicy ranch seasoning mix in a large mixing bowl. Form beef mixture into four 1/4-pound burger patties. Grill the burgers for approximately 4 minutes per side until they reach an internal temperature of 160 degrees Fahrenheit. During the last minute of cooking, baste both sides of the burgers with Kingsford® Honey Jalapeño Mesquite BBQ Sauce and top each burger with a slice of cheese. To assemble the burgers, place lettuce and tomato slices on the bottom bun, top with a burger patty bacon. 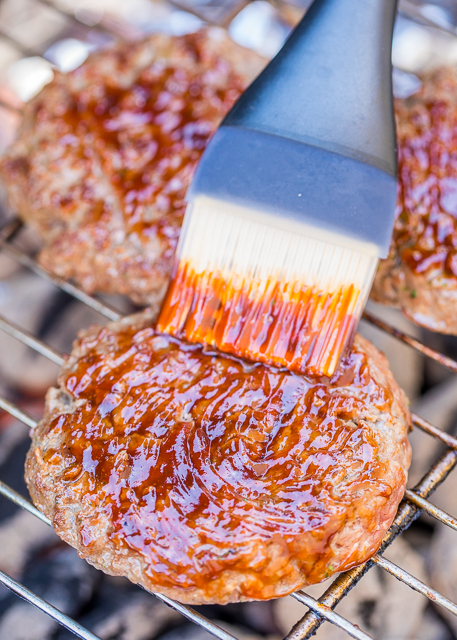 Brush additional BBQ sauce on the inside of the top bun then place on the burger.